Based out of Boston, Massachusetts, United States, the client is a leading producer of visual media for the Residential and Commercial real estate industry. With over 20,000 successful projects in the kitty, the client is into real estate photography, aerial photography, and architectural photography along with interactive floor plans and 360-degree imagery services. The client provides niche services to builders and architects of bigger scale projects and caters to hospitality and corporate sectors. With over two decades of experience in providing superior services to their specified customers, the client is highly quality focused. The client needed virtual staging services to help their consumers visualize space for their real estate projects. The client opted for Outsource2india's 3D architectural rendering service to visualize vacant rooms with furniture and give their customers fair amount of idea to visualize a specific house or office. The challenges in this project included image file transfer (the minimum size of an image was more than 5 MB) and angles of the photos on which the 3D modelers needed to work on. The lighting and quality of the images were another concern. The client needed furniture modeling to be done at a faster pace to allow them to provide the edited images to their customers to augment a sale. The turnaround time for any image was about 36-48 hours. At Outsource2india, 3D modeling wizards created photo realistic and authentic designs complete with room interior, furniture, and accents that transform the look of the empty rooms with creativity and technical excellence. For furniture virtual staging, the output is dependent on the input picture resolution, so our 3D modelers worked with client closely to provide the best possible solution at hand. The inputs from the customer included images and markups explaining the type of room. The team consists of eight 3D designers, one team leader along with an operations head to overlook the project. Team worked on about 20 images per day on an ongoing basis. Our highly experienced 3D designers either pick the furniture images from our existing photo/model library or create them to fit the client specifications. We used software like Adobe Photoshop and 3DS Max to create 3D designs. Our quality check process ensured the final outputs are precise and flawless. Outsouce2india owns a world-class 3D modeling studio that produces immaculate life-like furniture models for any virtual staging requirements. We have been in the business for over two decades with numerous successful projects from corporates, industrial, and real estate sectors. 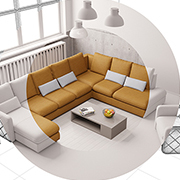 We create both low-poly and high-poly 3D renditions for a wide range of furniture modeling requirements. At Outsource2india, we have been providing top-quality mechanical engineering services to global clients. With an industry experience of over 20 years, we have provided quick and accurate 3D furniture modeling services to numerous clients. Our other services include SketchUp modeling, 3D architectural walkthroughs, 3D rendering services, etc. To learn more about our 3D furniture modeling projects you can contact us today.